Image courtesy of Thales Alenia Space. Yesterday, Thales Alenia Space announced that it has signed contracts to provide components and technological know-how for four radar satellites to be developed for South Korea’s Agency for Defence Development (ADD), the nation’s agency for research and development in defense technology. Code-named “425 Project”, ADD plans to operate a constellation of high-resolution Earth Observation radar satellites for military purposes, scheduled to launch in 2023. According to reports earlier this year, the South Korean government has budgeted 1 trillion won (US$888 million) for the project, which was originally supposed to comprise 5 satellites. 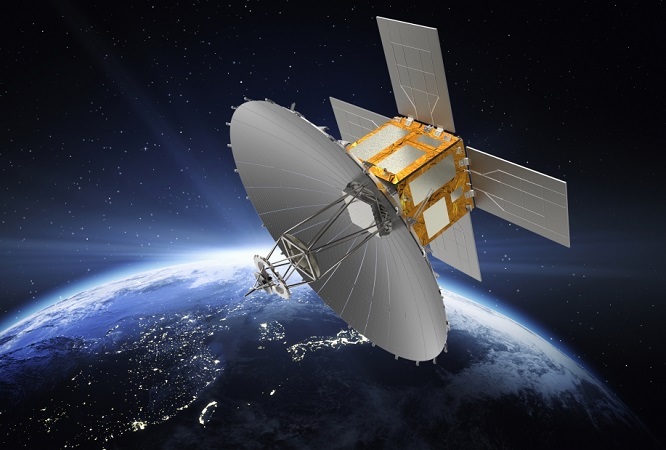 For the project, Thales signed one contract each with two Korean aerospace heavyweights – Korea Aerospace Industries (KAI) and Hanwha Systems Corporation (HSC); all three companies are part of a consortium led by KAI to handle “425 Project”. Under the contracts, Thales will provide Synthetic Aperture Radar (SAR) payloads and platform elements (especially for Control Momentum Gyro and sensors). The technology will enable short revisit times for each of the satellites, and support all-weather operations. Each satellite will also be fitted with an antenna developed by Thales, with 24 petals and a diameter of 5m. In addition, Thales will provide training and know-how to KAI and HSC in the development of SAR technology.